Make yourself as well as your team of hunters known with the stylish and bold Zombie Response Team Patch, which can be yours today. This fun accent will become a treasured addition to your kit when your friends see you proudly wearing it. Carefully crafted from polyester with cotton threading this accessory captures the fighting spirit of humans during the zombie apocalypse. Hook backing allows this circular design, which models traditional military insignia, to be applied to any tactical jackets or hat. There is a detailed graphic of a carbine length rifle with a large machete behind it. 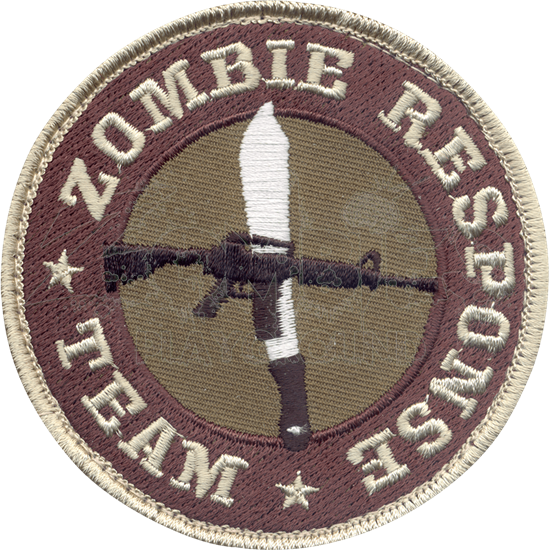 While the border has the stitched in phrase, ZOMBIE RESPONSE TEAM. Step up your tactical attitude with a unique accessory like the Zombie Response Team and you will not be disappointed.